I've been addicted to time lapse sequences lately. I think that they are an easy way to improved the quality of a fusion video, and can be fun to make. Normally, I'm already somewhere taking pictures, why nt use a secondary camera to capture a unique time lapse sequence. Whether it's from a little GoPro HD Hero 2 camera, my Sony NEX-5, Canon G11, or 5D Mark II, I have the ability to use an intervelometer. I think that adding motion also increases the interest in any time lapse video. Either using a Lawn Sprinkler timer with the GoPro, Automate with a bigger dSLR, or my custom built slow-motion dolly, there are tons of ways to create motion in your time lapse. 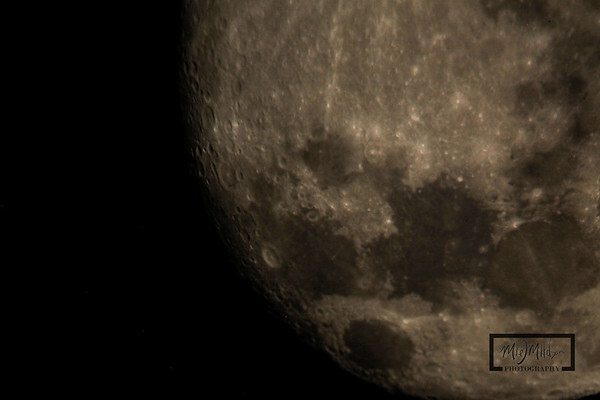 I had the privilege of using a friend's telescope one night to capture the moon. 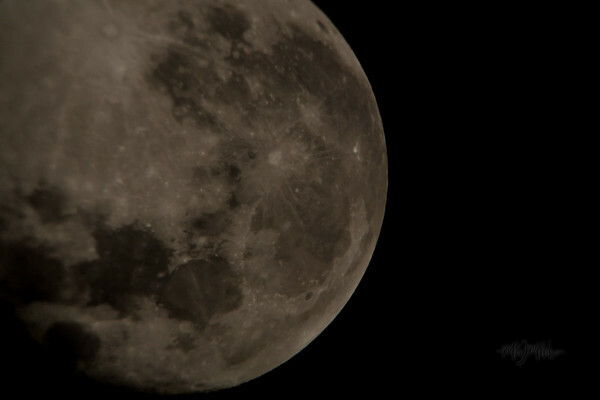 I was amazed at how touchy keeping the moon in the frame and trying to capture a focused shot would be. 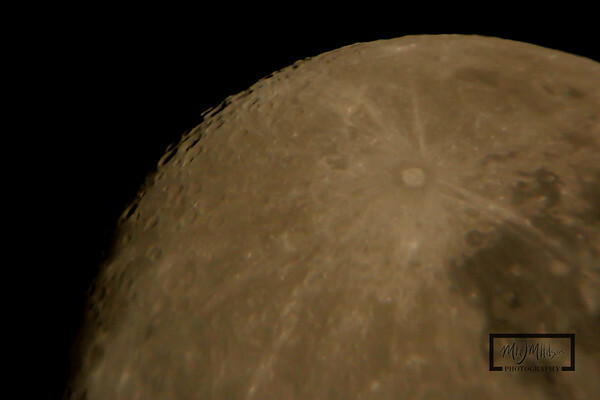 These are my first attempts at using a telescope and taking pictures of the moon. They are not very crisp, but I was excited to have anything after my first attempt. I look forward to trying to use the telescope again! 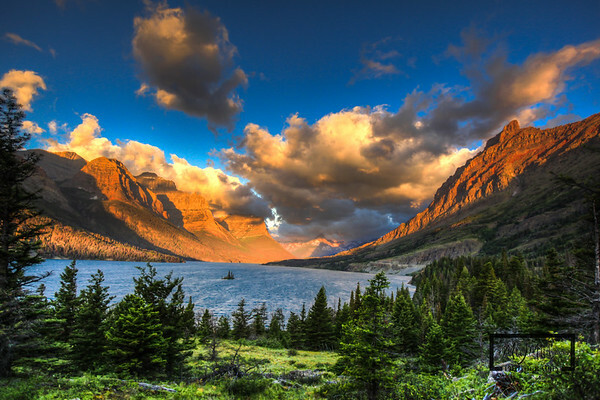 If you haven't had the privilege of traveling to Glacier National Park, add it to your "Bucket List" immediately. It will ruin all of the other National Parks that you have traveled to because of it's "Epic" landscapes and access to the most beautiful scenery on the planet. 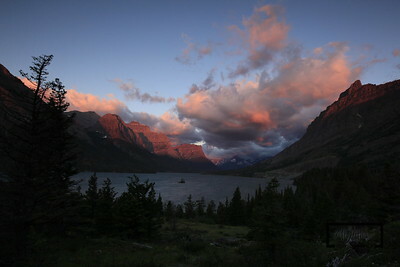 I was only in Glacier for a short time, and wished I planned for a longer trip. I was only able to explore a small portion of the east side of the park. The Going-To-The-Sun Road was closed passed Logan's Pass due to rain and rock slides, so I never got to the west side of the park on this trip. 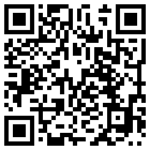 Plan your trip ahead of time and know what landmarks you want to shoot and the best times for each. Here are a few quick stories from my trip and some lessons learned. I got up early on 2 mornings and headed out to Wild Goose Island to capture the sunrise. This is a very popular destination. I was the first to get here on one morning, but was quickly surrounded by other photographers trying to reserve the best spot. I arrived almost an hour before sunrise on the first day and got my pick of spots. The second day, I arrived a bit later, and there was already a Photography tour-van that had unloaded a fleet of aspiring photographers. The nice thing about the Wild Goose Island lookout is that there are plenty of spots just down the road a bit to choose from. The main lookout area is the most popular spot, and has an area that everyone shoots from, so venture down a bit and get a different perspective. Most of the other photographers up that early are professionals from around the country visiting Glacier and trying to get a unique version of the same shot everyone else gets. Make lots of noise, as there were reports of Grizzlies in the area only a few days before I got there. I just wear a bell, as I have a hard time remembering that I'm suppose to make noise in sure a peaceful place. There are even a couple of spots on the other side of the road up the bank that make good shooting spots, so you don't have to crowd around other photogs if you don't want to. The ultimate goal is to have no wind so you get the reflection of the Mountains off St. Mary. 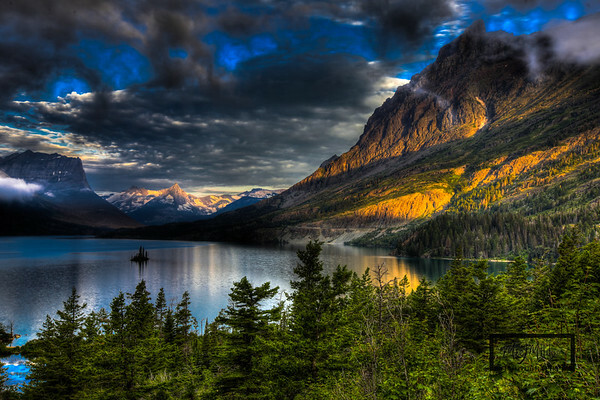 I did not have that luck, so you'll need to plan on a few days of camping out at sunrise if you want this shot. Each day I had different conditions, and some cloud cover. This can add depth, but it also did a great job clocking the sun behind me. When the sun gets high enough over the mountains to light up the peaks, while still casting shadows, it's amazing. Some of the photographers sat there and composed a few shots. I used my Promote Control and snapped continuously for the entire session. I didn't drive almost 2000 miles to wait until the light was perfect, I wanted as many images as I could take. I also chose Wild Goose Island as my sunset spot, due to it's proximity to the St. Mary's park entrance and visitors center. You can find a million other spots to capture the sunset and can use each day to scout out potential locations. 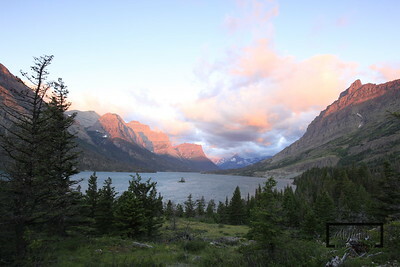 The Wild Goose Island spot is nice because there was enough room to pull out folding chairs for our entire group to sit and chill, enjoy a cold beverage, and watch the sunset, while I tinkered with my camera gear. In the future, I plan on taking a trip out here solo so I can set my own agenda. I was not aware that Glacier had a park astronomer. It does. We met the park Astronomer at the St. Mary's visitors center, who is out each night to educate anyone who will listen about the night sky. We were lucky enough to have the astronomer to ourselves for a couple hours and was able to look through his telescope. 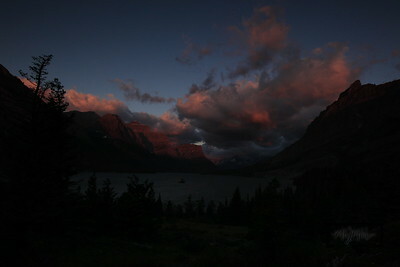 If you are into Star photography, Glacier offers some of the best viewing due to the lack of light pollution. The Milky Way is visible and you'd never be able to count the number of visible stars. Head up to Logan's pass and you might find yourself in the company of the Big Sky Astronomy club. Unfortunately, after a couple of mornings getting up for sunrise, I never made it past about 11pm at night and had to sleep sometime. Yes, there are other places to shoot than just Wild Goose Island. That just happens to be one of my favorite locations. Pretty much anywhere you stop in the park, you can get out and have breathtaking scenery all around you. Plan to try and capture some panoramics. A tripod is a must for great panoramics, but not required. I use a Panosaurus panoramic head on my tripod and use a wide angle lens to capture the scenery and stitch the different images together with either Autopano Giga or Photoshop. Here are a couple of my favorites. 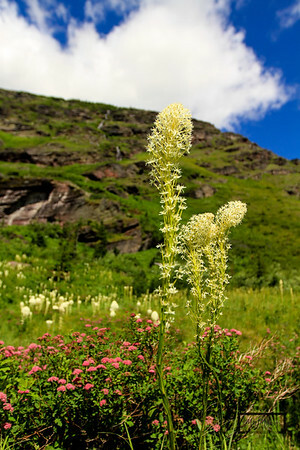 Heralded as the most scenic road in the country, you can stop at hundreds of different spots along the Going-To-The-Sun Road at almost guarantee an epic vista. We only went as far as Logan's Pass from the east entrance due to rock slides, but give yourself an entire day to explore this passage if it's open. Even if it's 90 degrees and hot out in July where you are from, the Going-To-The-Sun Road doesn't open until mid-July some years. I just saw that they had freezing temperatures overnight in August, so remember to pack a jacket and warm clothes, as you're in the mountains! 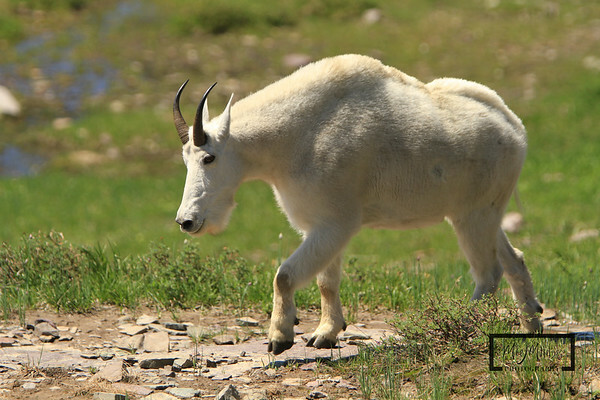 There are turn-offs along the way for you to stop so you don't disrupt traffic, and watch out for wildlife on the road. I came upon a female moose in the middle of the road on one of my sunrise journey's into the park. 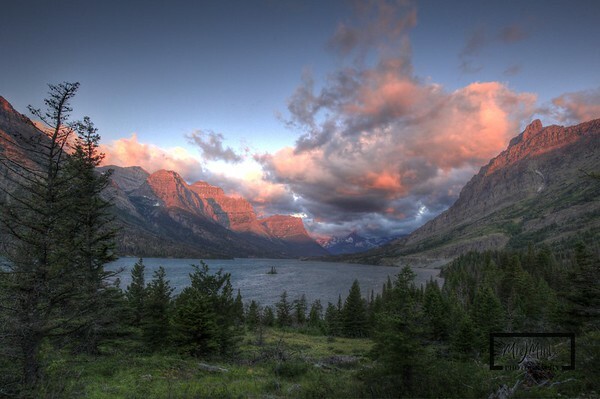 Glacier National Park is home to over 70 species of mammals and over 260 species of birds. 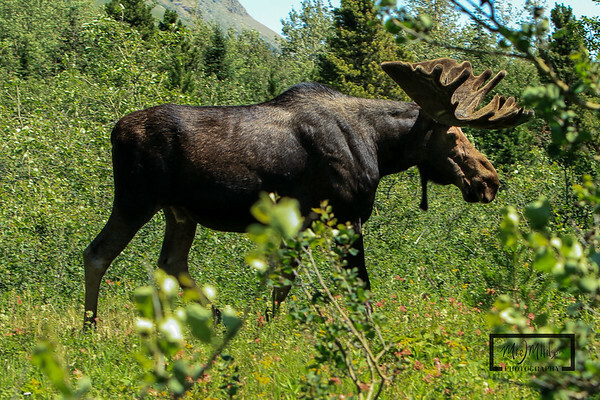 If you don't see wildlife, then you need to get out of your car and look around. We saw a black bear, mountain goats, big horn sheep, eagles, and came face to face with a bull moose. 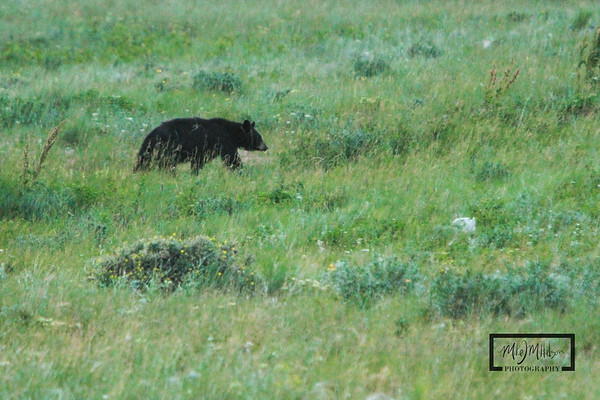 You need to have bear spray with you, and know how to use it. They have educational sessions at the visitors center with a demo on how to use bear spray canisters. I would also recommend a bear bell, or something that will let wildlife know that you're coming. The last thing you want is to come between a mountain lion and her cub, or a hungry Grizzly that can smell your snickers in your pocket. That reminds me, buy some scent-proof food bags if you are going to hike. I think that the bears know exactly where the food is, but it's peace of mind to you if you know that they cannot smell it directly. One thing that I wished that I had was a way to hike and have my camera mounted to my chest. I saw a few people with those chest holsters/vest, and have seen them in magazines before. Only after I missed the shot of the bull moost looking directly at me did I realize the mistake of not having one. I spent valuable seconds getting my backpack off to get the camera out as I backed away. Would have been a much better shot if I would have been able to pull the camera into a ready to shoot position in a quick second. 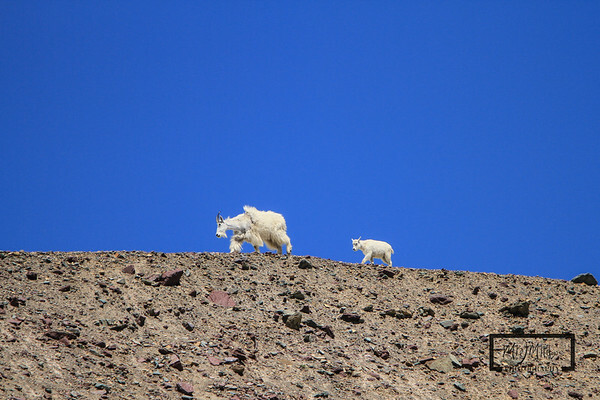 In addition to the big animals, there are plenty of small critters to photograph, and having a longer lens helps. 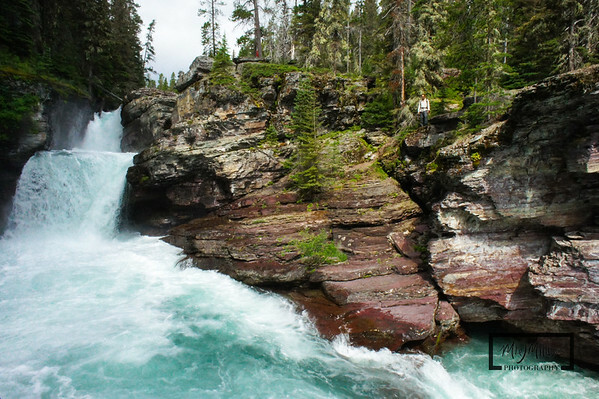 If you're willing to do some hiking, you'll be able to find a number of waterfalls within Glacier National Park. Depending on the time of day, you should try and plan our arrival during the best light. On thing I wish I would have brought with me was polarized or ND filters to limit the amount of light getting into the lens. This will allow you to slow down the shutter speed to capture dramatic effects of the running water over the falls. The only thing I could do was set the f stop to the highest number I could. 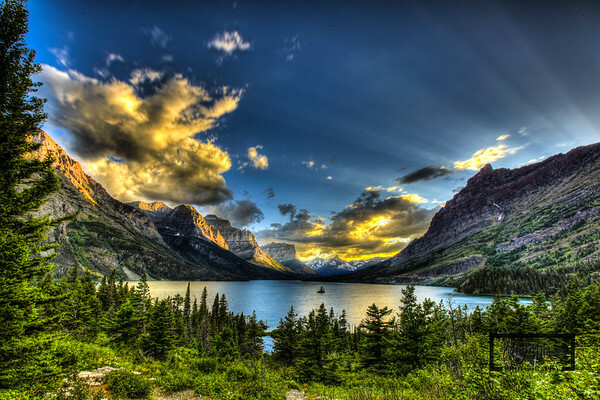 I've only scratched the surface, but hopefully have generated interest in your trip to Glacier National Park. In the future, I plan on spending much more time there. Some of the other photographers slept in their vehicles, and spent weeks exploring the park. Hopefully some of my shots will help inspire your planning to Glacier. 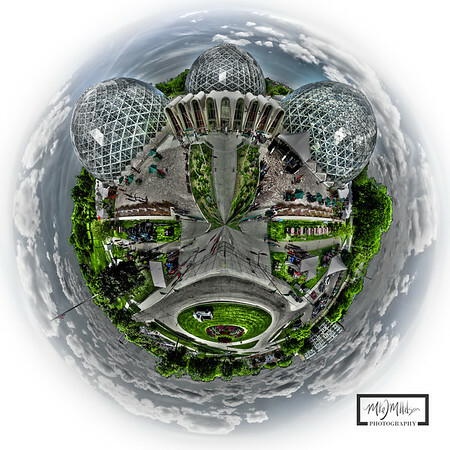 The Mitchell Park Domes were host to the Milwaukee Domes Art Festival this past weekend. Live music, food and adult beverages, and a slew of artists surrounded by the Domes. This is a juror-ed 3 day art festival, and I took the opportunity to capture some additional images during the show. 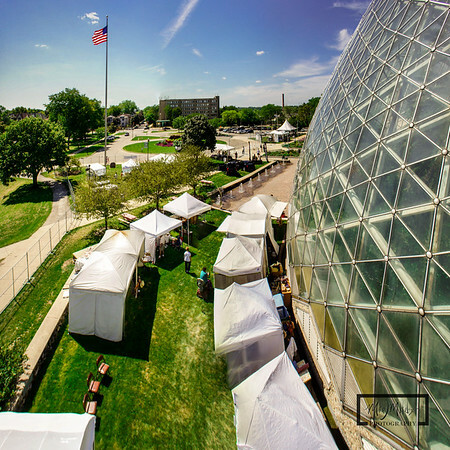 Here is a Pole Aerial Photography panoramic of the domes during the festival. My booth was at the end of the row on the south side of the domes. I used the Panoramic above to create a Spherical Panoramic of the event as well! I also had a GoPro and Sony NEX-5 capturing time lapse sequences throughout the Festival. I'll post those to this thread when I get a chance.